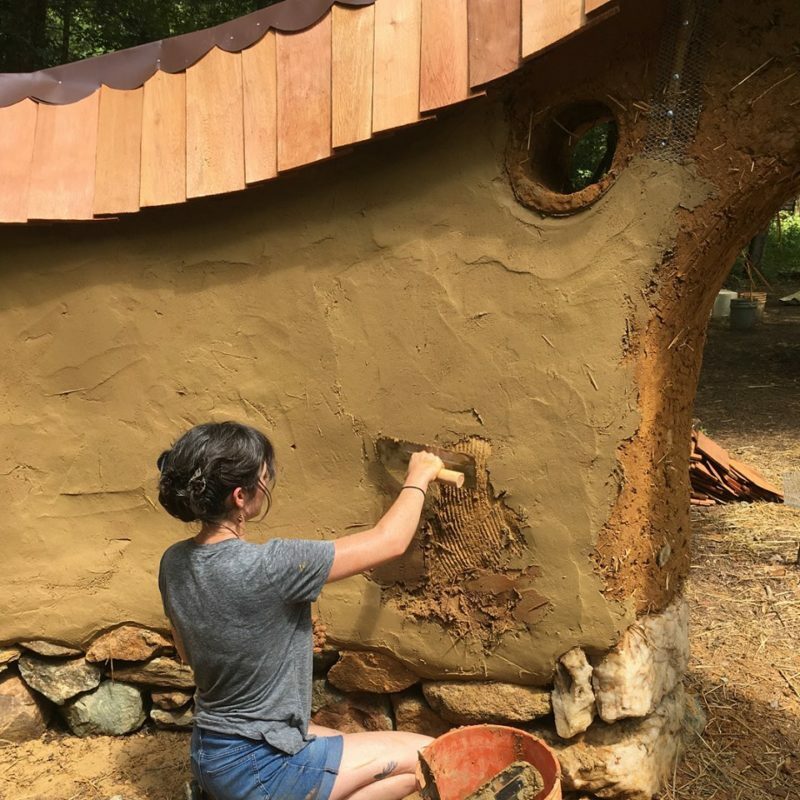 Cob construction: Learn how to build strong, beautiful earthen walls, put in windows and doors, electricity and plumbing, integrate art/niches/arches, construct solid foundation systems and attach roofs, and variations on cob constructions such as making adobe bricks. Light-straw-clay: an infill techniques, combining straw and clay-soil. This is a wonderful way to fill in the walls of conventional stud- or timber-framed buildings. It insulates well and makes for solid, sound absorbing interior and exterior walls. 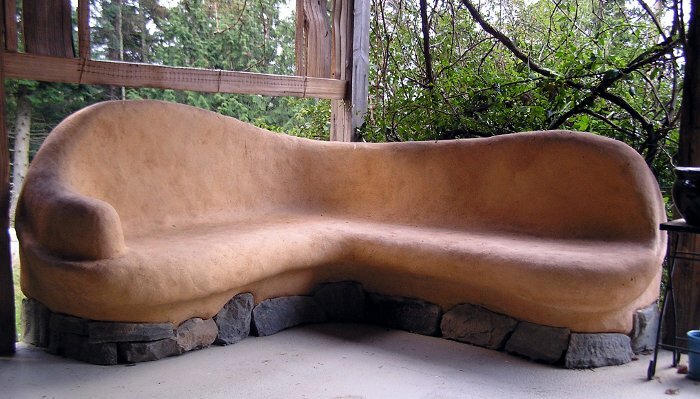 Earthen plasters: simple, inexpensive materials can make beautiful, healthy earthen finishes. Learn how to apply these plasters on cob and light-straw-clay walls as well as how to use them in conventional buildings and apply them to surfaces such as concrete, drywall and plywood. Earthen floors: make durable, soft, dust free floor surfaces from sand, clay-soil, straw and linseed oil. Learn how to build these floors on “compacted gravel” slabs, as well as how to install them in existing conventional floor surfaces such as concrete, plywood or OSB. 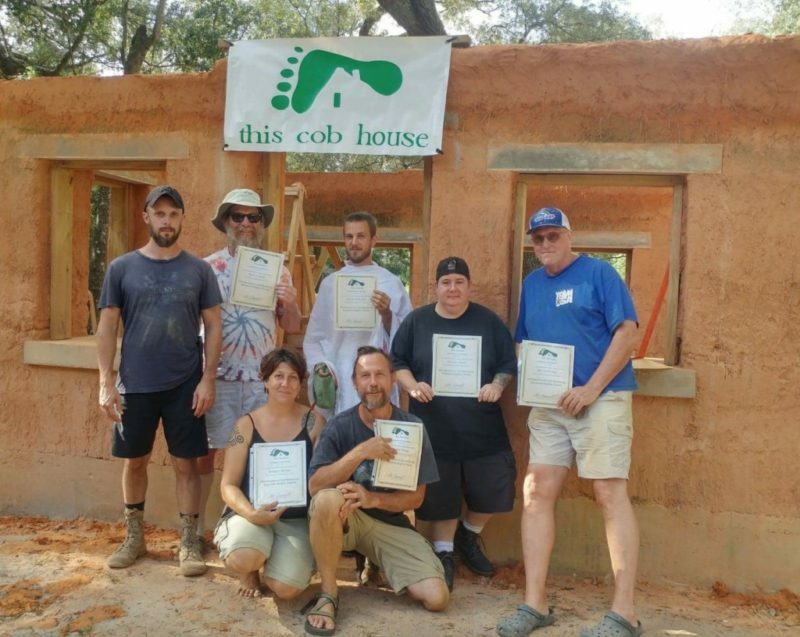 Students will be able to construct their own earthen cottage, using simple, natural materials, from floor to ceiling. We will talk extensively about the basic materials of sand, straw and clay-soil: what to look for, how to find them and how to process them for the various techniques. For those who are not yet in a position to build from scratch but still want to give up drywall, latex paint and toxic carpeting, these techniques can be easily, inexpensively, and beautifully integrated into a natural renovation project. This is a serious building workshop. We believe that the more you build, the better builder you will be! For about 6 hours per day we will prepare materials and use them in real construction projects. Throughout the workshop, new skills and knowledge will be layered and practiced, instilling confidence and joy in these ancient practices. The remainder of the time will be spent on lectures and discussion related to design and appropriate technology. We enjoy empowering people to shape their living situation in a way that serves them as humans, honoring our deep needs for feeling safe, healthy, self sufficient and connected. We will introduce strategies for balancing the challenges of finance, family and building codes. Evenings will include slideshows on different techniques and previous House Alive projects, from Mexico to the Pine Ridge reservation, to show students the broad palette of possibilities. Believe it or not, we will also have some time to nap in the early afternoons and play some music around the fire in the evenings. Additional clarity and knowledge can be gained through our publication “My House of Earth,” in which all material covered during the workshop is explained in great detail. A copy of the e-book will be sent to students prior to the workshop. More information can also be found by reading our numerous articles on earthen construction, design and appropriate technology. Cascina Abbondanza – meaning plenty farm – is a small farm in the Piedmont countryside near to the small and ancient town of Bene Vagienna, 30km from Cuneo, 70km from Torino and 80km from Savona. The surrounding area, thanks to the Stura and Tanaro rivers, is fertile and the soil is rich. We are on top of a gentle hill that we call “beinale.” You’ll be delighted by the magnificent landscape of the Maritime Alps, with a view embraced between the first Langa’s hills and the austere mount Monviso standing in the middle with its 3800m of elevation. Lucio, Dani, Sam, Dodi, Giulia, Martina, Mattia, Matilde and Vittoria Luigia are looking forward to greet you at Cascina Abbondanza. We live in harmony with the land and we are working to make it fruitful, renovating what already exists, creating something new and respecting people and earth. Cascina Abbondanza awaits you for the Workshop “My house of earth”! During the workshop you will camp in the area equipped with composting toilets and outdoor showers. Please bring your own tent! Lucio will cook healthy food with natural ingredients, local seasoning and organic vegetables. Each meal will be balanced according to the activities in schedule, to find for you the correct diet to approach the day full of energy! The menu will be suitable for everyone, vegetarian and vegan included. Please, let us know if you have any kind of intolerance or if you need to follow any specific diet. If you want to bring children or friends, they are also welcome! Cascina Abbondanza and Cooltura are looking forward to meet you!